Just one thing to always keep in mind: never take it out on the employee behind the counter — they had no say in corporate’s decision, so its not their fault. Instead, voice your opinion directly to the corporate office. 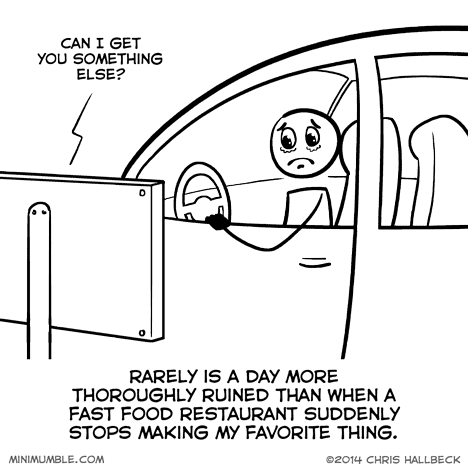 As a frequent victim of this sort of thing, I could not thoroughly agree more…be it fast food restaurant or multiuse store cashier or…whatever. We don’t have any ultimate say in such things. I remember many times it boiled down to demographics…at one fast food place I worked, they stopped selling tenderloin fritters because the most popular demographic for it wasn’t great in my state, so they stopped sale of said item in my area. Unfortunately corporate failed to realize that my specific community had an unusually high population of that demographic and they WERE NOT HAPPY with that decision. Many people broke down in tears on one April 1st when Burger King stopped making whoppers. Then the next day they found out that it was an April fool’s day joke. There are cookbooks and websites devoted to duplicating favorite fast food items. If you find yourself addicted to a certain thing, see if there is a recipe for it already. You might soften the blow for yourself if the unthinkable happens. Also, you may try your hand at recreating it yourself, with a little luck and trial and error.